Katie Peterson passed from this life on March 31st, 2019. She was also known as Mom, Grandma, Grammy, Aunt, and simply… Katie. Katie was born Oct. 19, 1929, in Murray, Utah, and lived her life in Midvale and West Jordan. She was on this earth for 89 years and spent them well. She loved and served her family, adored her grandchildren and valued her friends. Katie and her husband Mel took their family on many camping trips and enjoyed travel when Mel retired. 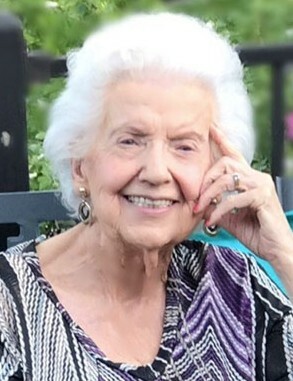 She was a member of “Red Hats” and loved playing cards every Monday night with her special neighbors. If you wanted a description of Katie, you’d hear words like: generous, loving, stubborn, happy, giving, loyal, affectionate, and lady-like. Katie never left her house unless her hair was “done,” her makeup on, and earrings in place. Katie liked to cook and as recent as 3 weeks ago, took a tray of deviled eggs to a neighbor. Katie was easy to love and her four boys adored her, as well as her daughters-in-law and grandchildren. Bruce and Don took her on vacations and small trips. Jim brought her to his home for Sunday dinners. Lee took her out to weekly breakfasts. Katie was happily watched over and cared for as she grew older. Katie loved her extended family. She had 11 siblings, so she had many nieces and nephews whose names she knew and kept an interest in their lives. Our world is a little dimmer since Katie’s light has moved on. Bruce and daughter-in-law, Lynell and their children Matt (Franzi), Tommy and Callie. Jim and daughter-in-law, Donna and their children Jenalee (Ryan), Alicia (Mikey), Sean (Tammy), Shannon and Richmond (Heather). Don and his children Brandon, Jake and Rachael (Cameron). Lee and his sons Kyler and Bo and thirteen great grandchildren. Katie’s funeral will be held on Tuesday, April 9th at 11:00 am in the Westland 2nd Ward Chapel, 7171 S. 2700 West, West Jordan, Utah. Viewing Monday evening 6-8 pm at Goff Mortuary, 8090 S. State St., Midvale, UT, and at the Westland 2nd Ward Chapel one hour prior to services. Interment at South Jordan Cemetery after funeral.